1. CLU and prostate cancer. Maximino Redondo; Teresa Tellez; María Jose Roldan. Mazzarelli P. Pucci S. Spagnoli L.G. The biological function of clusterin (CLU, also known as ApoJ, SGP2, TRPM2, CLI) has been puzzling researchers since its discovery and characterization in the early 1980s. Approaches such as cloning, expression and functional characterization of the different protein products generated by the CLU gene have now produced a critical mass of information of tremendous biological importance that are teaching us an important lesson in molecular biology of gene expression regulation. This volume brings together the contributions of top researchers in the field, providing an overview and synthesis of the latest thought and findings relating to CLU. 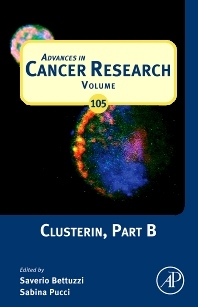 "This classic and essential series presents critical overviews on select aspects of both cancer research and the basic underlying sciences." "Excellent, highly informative, in-depth reviews...expertly written, up-to-date, and well-referenced." "This is a series that has a long tradition of excellence in the field of cancer biology."